With true Swedish engineering, the world’s foremost expertise, and access to high-tech labs – Sigma Connectivity has worked in tight partnership with SIRIN LABS to develop their first product: SOLARIN. SOLARIN is a truly smart phone for the international business person who carries a lot of sensitive information but doesn’t want to compromise on usability, quality, or design. SOLARIN encapsulates over 2500 components within a meticulously designed exterior whilst achieving faster, seamless connectivity across any continent. To develop and launch SOLARIN, SIRIN LABS has worked with a network of extraordinary partners, suppliers and passionate experts; guided by the vision of their co-founders. SOLARIN has a high connectivity performance enabled by complex antenna arrangements which sets a new benchmark in global usability. It is the first global mobile phone to incorporate revolutionary WiGigTM multi-gigabit wireless communication, pushing data transfer limits enabling ultra-fast file transfer. Never before has anyone within the mobile industry been able to take such advanced technology and high end materials to the market. Working with high quality material has meant dealing with suppliers who have never before delivered to the mobile or tech industry and complied with supply chain and production technologies associated with the mobile industry. SIRIN LABS contacted Sigma Connectivity in spring 2015 and with access to a complete set of engineers, the right expertise, and a world class lab environment, they found a strong match to their own R&D expertise. Sweden, and more specifically Lund, is well known for their advanced technologies and mobile phone development for over three decades, and with a global network the best competences from each partner enabled SIRIN LABS vision. From Sigma Connectivity, working with SIRIN LABS has been fantastic. SIRIN LABS have never bowed to the challenge of developing and launching such an exclusive and complex product in such a challenging market. 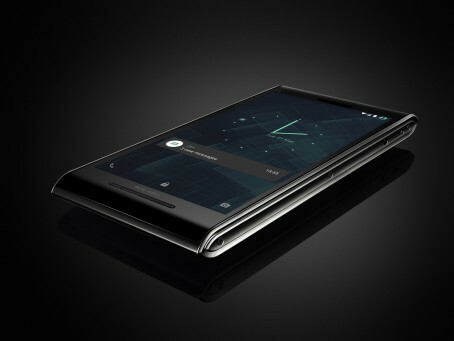 It has been especially important for Sigma Connectivity to successfully deliver in this project, given that it is SIRIN LABS first product and thus defines the company when it is launched. Sigma Connectivity has worked on many projects of this kind before, but this is one of the most complex with regard to both technology and the supplier base that enabled the product. “We have been driving the development of a fantastic product and we are incredibly proud of what we delivered to Sirin Labs. It places us where we belong, at the forefront of product and technology development. True engineering craftsmanship.” Fredrik Hedlund, CEO at Sigma Connectivity.